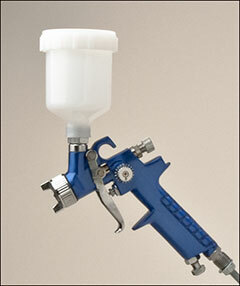 Touch-up guns, gel coat spray guns, resin spray guns, replacement parts, nozzle cleaning brushes. 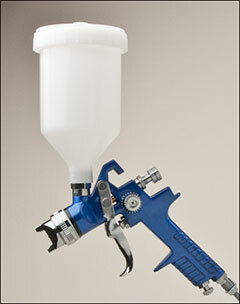 Preval spraymakers are available on the Preval sprayer page. HVLP touch-up gun is perfect for touch-up of finished composite products and for mold repair. High quality HVLP gun has no flat seals behind air cap to deteriorate in acetone and has limited seals internally. Supplied with a 2.0 mm nozzle, perfect for most resins and gel coats. Fluid nozzles are stainless. Each gun includes a 0.12 liter plastic cup. Larger capacity aluminum cups are also available and listed below. Smaller nozzle assemblies are available for thinner materials. The die cast aluminum anodized body is comfortable in your hand and just the right size to get into tight areas. Parts list available with prices. 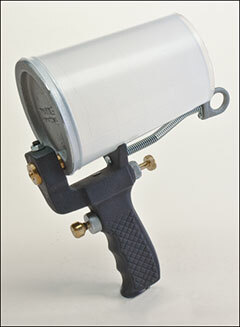 HVLP spray gun perfect for exterior finishing and refinishing of composite products. High quality HVLP gun has special plastic flat seal behind air cap threads that does not deteriorate in acetone. Limited internal seals. Stainless fluid nozzle. Supplied with a 2.5 mm nozzle, perfect for most resins and gel coats. Gun includes a plastic cup. Aluminum cups are also available. Smaller nozzle assemblies are available for thinner materials. The die cast aluminum anodized body is comfortable in your hand and just the right size to get into tight areas. Parts list available with prices. Vacuum fed, lightweight aluminum gun designed for spraying gel coat and resins. Will also spray parting films, gypsum, tooling gel coats, sandable primers, granite enhanced gel coats, adhesives, and paints. With the largest nozzle size, it will even sandblast. Five minute clean-up. Wipe lid and nozzle, throw away cup, and you’re ready to go. Air requirements: 70–90 PSI, 5.8 CFM @ 80 PSI. Cast aluminum lids are threaded to accept precision machined nozzles. Replacement nozzles thread directly into lids; no additional hardware needed. Cups fit directly onto lid, with no other seal between cup and lid. Brass nozzles available in 9 sizes. Needle valve flow control gives you precise metering of resin or gel coat. Long life, solvent-resistant O-rings. Nozzle sizes available and applications : 1/32"–0.8 mm for parting film, 5/32"–3.9 mm for gel coats, 1/16"–1.6 mm for parting film, 3/16"–4.7 mm for gel coats, 3/32"–2.4 mm for paints, 7/32"–5.5 mm for gel coats with flake, 1/8"–3.1 mm for resins, 1/4"–6.2 mm for gel coats with flake, 9/32"–7.1 mm for sandblasting. Gun includes heavy-duty paper cup, a graduated plastic cup, plastic cup liner bag, 3/16" nozzle, gel coat mil gauge, gel coat/catalyst chart, and a nozzle cleaning brush. 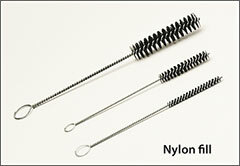 Nylon fill tube brushes for cleaning nozzles and other hard-to-reach areas on all guns and spray equipment.